Jo Lawry always loved Sting's songs, and now she sings them with him. Growing up on an almond orchard south of Willunga in the 1980s, Jo Lawry found herself falling in love with the music of British superstar Sting. It was probably inevitable. "Being a Sting fan is sort of like a family business," says Lawry, whose passion for the former Police frontman's music was kindled by older brother Kym and sister Tina. "The two of them, from a very early age, turned me into a very, very dutiful Sting fan." Back then, the budding musician could only dream that she might one day meet her musical idol, let alone perform with him. 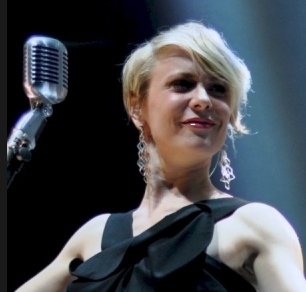 Now she not only shares the stage with Sting each night as backing vocalist on his world orchestral tour, but also features on his latest album Symphonicities - thanks largely to the chance recommendation of a woman she barely knew. All of that will come home with beautiful synchronicity when Lawry performs with Sting on Australia Day at this year's Barossa Under the Stars concert. The hometown show caps off a series of wonderful opportunities, coincidences and connections which have opened up for the 32-year-old jazz singer since she relocated to New York to study seven years ago. Elder Conservatorium graduate Lawry had forged a solid reputation while continuing her study in New York, fronting her own quintet and working with such jazz luminaries as Bobby McFerrin and Fred Hersch, but had little experience as a backing vocalist when she got the surprise call to audition for the Sting gig. A fellow performer named Laila Biali already had auditioned but the producer still wanted to see more people, so she put Lawry's name forward. "She just recommended me - we weren't that close, we just knew each other peripherally through a few different people - which was a pretty classy move, given that she didn't have the gig for sure yet," Lawry says. "The happy ending to the story is that we both got it." That gig was a performance at Durham Cathedral near Sting's hometown of Newcastle-upon-Tyne in northern England, designed to showcase his previous album, On A Winter's Night, and was filmed for DVD. Sting had been asked to do a Christmas album but declined, choosing instead to do what he called "a winter album" covering traditional songs, lullabies and carols from the British Isles. "For this thing, he had to have (someone with) some pop and world music, more ethnic music knowledge, and then also be able to do a more strict, choral, old sound," Lawry says. Having initially auditioned for producer Robert Sadin, Lawry first met Sting to rehearse at his house in Italy. "That went really well, and there was a song on that set that he threw in from his older repertoire. Because I'm such a fan, I knew the song and said 'If you want the backing vocals for that, I can throw them on'." Another coincidence saw Lawry play violin on the resulting tour. She had studied the instrument for about 10 years, but only until she was 15. After a visit home in 2008, she took her violin back to the US and started practising again. "I was bringing it to be repaired on the day of the Sting audition. It was 100 degrees and I didn't want to leave it in the car, so I brought it in. They were like 'Oh, you play violin as well' and I was like 'No, no, no, I really don't'. But when I tell Sting that I'm really not technically good enough to play with him, he just says 'Baloney, bring it, do it ... play this, play that'. He improvises a lot and I get to feature on some things - there are even some solo moments in it, which is something that I would never have expected." After Durham, Sting's focus shifted to orchestral reworkings of his greatest hits and a tour which initially featured the 45-piece London Philharmonic Concert Orchestra, along with his own quartet of bass, guitar, percussion - and Lawry as the sole other vocalist. "He's very generous as a performer. I sit there when we're in rehearsal and he'll be wildly gesturing at me, like 'Join in on this bit'. He wants it to be a collaboration and he wants you to just dive in. He wants everybody to shine," she says. "He's a real sort of family atmosphere guy." During one after party at Sting's house, he requested Lawry sing a folk song called The Blacksmith, which she had previously performed during one of their jam sessions. "This other guy's next to me, clapping his hands along. I thought, 'He's getting into it, that's nice'. Mary, the harpist from the group, said later to me ... 'Oh, it was amazing you doing that whole, long song with Bruce Springsteen sitting right next to you'. I had no idea at all! It's certainly not the circles I ever thought I would be singing in." As a teenager, Lawry toyed with a career in musical theatre, having performed in Les Miserables. She first started studying classical singing at the Elder Conservatorium, then took a year off to travel. "I just felt I needed to be able to have a bit more creative input in the material and that just wasn't going to happen in classical," she says. Instead, she returned to do the Jazz Studies course, graduating with honours and continuing to teach at the Conservatorium for about 18 months. With the help of a Fulbright Scholarship and the George Murray Fellowship from Adelaide University, as well as an Australia Council grant, Lawry went on to New York to do her masters. Her intention at the time was to "just do the study and get the heck back here". "I really didn't intend to stay," she says. "I still feel like it's somewhat temporary ... but I was getting some amazing opportunities that were once-in-a-lifetime." Among these was taking part in a week-long workshop and performance led by Bobby McFerrin, of Don't Worry Be Happy fame, with about 20 other singers at Carnegie Hall. "It was people from all over the globe with different styles - jazz, Arabic, Tuvan mouth percussion." She also performed with US jazz greats including trumpeter Jon Faddis, saxophonist Donny McCaslin and, most valuably, pianist and composer Fred Hersch, who has released more than 30 albums of his own and performed on countless others. Hersch invited Lawry to be part of his Pocket Orchestra quartet. "That's been a really important and fortunate association for me," she says. "It's the sort of thing that just doesn't come along very often, especially for a vocalist." Even so, the work in New York had been "bits and bobs" rather than regular. One fortunate gig has been appearing as artist-in-residence at the Australian Embassy in Washington DC. "It always seems to come along at the right time - there'll be an event or a memorial," she says. It's work that has led to her performing at the Australian Consulate in New York. The main focus has been on continuing her doctorate, with the help of another scholarship, this time from the New England Conservatory. Her own debut album, I Want To Be Happy, was released in 2008 to rave reviews and named among the Best CDs of the Decade by jazz bible DownBeat magazine. On it, Lawry covered one of Sting's songs, Until - little knowing what fate had in store for her. "I had to choose that out of maybe eight Sting songs that I have arranged and covered before," she says. It wasn't until they had performed a number of shows together, however, that Lawry plucked up the courage to tell her new boss she had recorded one of his songs. Plans for a second CD have had to be postponed. "I had it all planned, I've got the repertoire ready, I know the people, I know the band, I know the studio," Lawry says. "But I've had to put it on hold, for a very attractive reason." Music is in Lawry's blood. Her aunt was Adelaide folk singer Tina Lawton, who released three albums and won national acclaim before her death in a plane crash while holidaying in Kenya in 1968, at the age of just 24. "At the first folk festival of Australia, she was the poster girl. She used to be on the Country and Western Hour and she collaborated a lot with Don Burrows in the early days of Australian TV and records." Lawry never knew her aunt, but similarities between the two petite blonde songbirds are hard to miss. With both Sting and as vocalist with another project, James Shipp's Nos Novo, Lawry has had to delve into more traditional folk repertoire. "I find myself singing a lot of old Celtic-based tunes, which is what my aunty, Tina Lawton, did," she says. The first track on Lawry's CD is a Scottish classic, The Water is Wide, which she learned from Lawton's own recordings. "More and more I am gravitating towards the style of music and repertoire that she sang," Lawry says. "I just feel like I'm taking care of some unfinished business, which is a really great feeling."